isn’t this flower just beautiful? 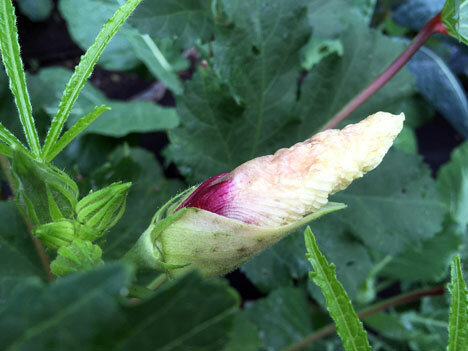 i know that some of you know what plant this bloom belongs to, but those who don’t may be surprised to learn . . . that it’s okra. 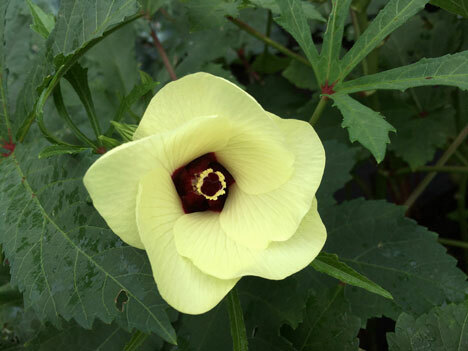 i would grow this plant just for the flowers, they are so pretty and fleeting. they last just a few hours, then they fold up, shrivel away, and reveal their “fruit”—green pods that will be ready to pick within a few days. who says the vegetable garden can’t be pretty too? these beautiful plants are growing tall down the center of the mound on which they are planted, like trees to shade the greens underneath. 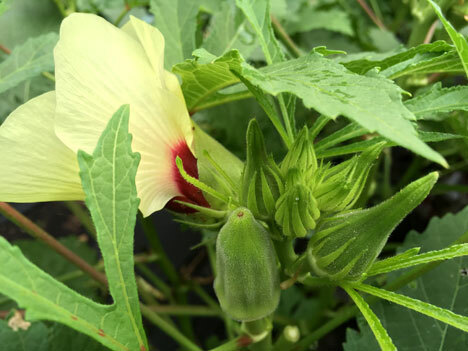 and as long as we keep picking the okra pods—somewhere from six to twelve are ready each day—they will remain prolific. and we do have to keep an eye on them right now; they will go from two inches to five or six inches in the course of a day. i’ve actually been checking them twice a day to keep them from over-maturing and becoming fibrous. 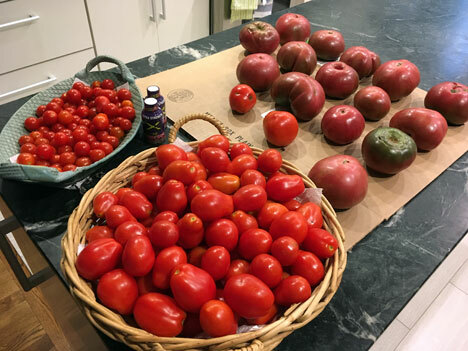 tomatoes are another garden product that we’re picking twice a day—they are so large and prolific this year that we can hardly keep up. in fact, we are away from home this weekend (more on that in a minute) and i’m kind of dreading what i’ll find when i get home! plenty of rotting fruits on the vine, i’m sure. that dry weather we had most of the summer, followed by a couple of weeks of rain has caused a lot of cracking in the skins which makes them vulnerable to bacteria. fortunately there are plenty to make up for the ones we throw away. before we left home on thursday i had been cooking a batch up almost daily—some on top of the stove and some roasted in the oven. and we have plenty of cherry tomatoes for drying this year which i’m thrilled about too; i haven’t been able to do that for a couple of years and i miss it. i use this method, which works really well for me. while the tomatoes simmer or roast i get a little time to knit, since it’s important to keep an eye on them. wandering away to work on the computer would probably cause me to lose track of time and allow them to overcook. my first priority since i last showed you progress was to seam up the twill pullover—everything went together really smoothly and it looks great; just needs a good soak and wash now to make that fabric sparkle. don’t those side seam cables look great? i am really pleased with the choice of cable—it is so defined and crisp, a super-neat finish. i will soak and wash that on monday, when we are back at home. 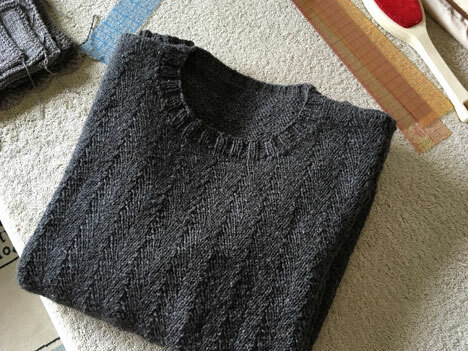 with that done, i could pour my efforts into my dock and cabin cardigan, as well as the scarf book project. 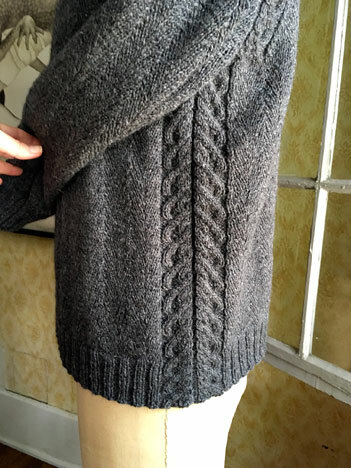 the front that i showed you the last time i blogged has grown considerably—just before we left home i was about three-quarters of the way to the neck shaping, which begins before the underarm bind off in this case. and with a couple of hours of car knitting on thursday, i got to that point and a little beyond; i think i’m ready now to start the armhole shaping. which is a big ‘yay’ because after that the rest goes very quickly as the stitch count reduces continually to the shoulder. sorry for the really crappy photo; we are in motel room and you know how the lighting is in these places—yuck. with the twill pullover complete, it was time to turn to the swatches i worked on last week and pick the next project. 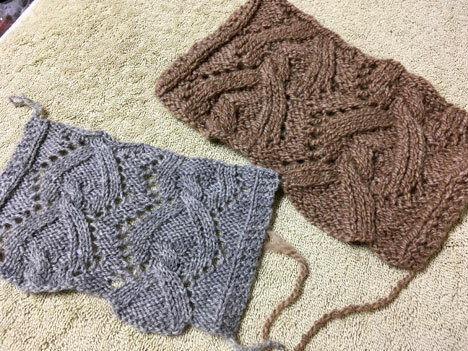 should it be the sweet little openwork cardigan first or the argyle pullover? 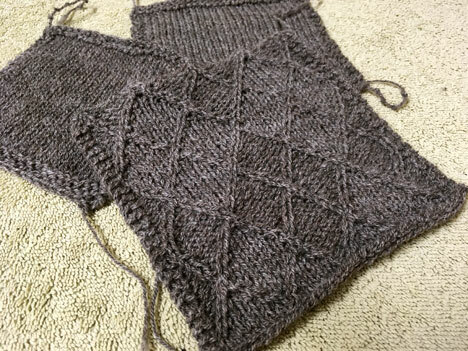 i feel like i’ve put a lot more thought and planning into the argyle at this point, so i drafted a bare bones pattern and cast on a sleeve cuff the night before we left home. 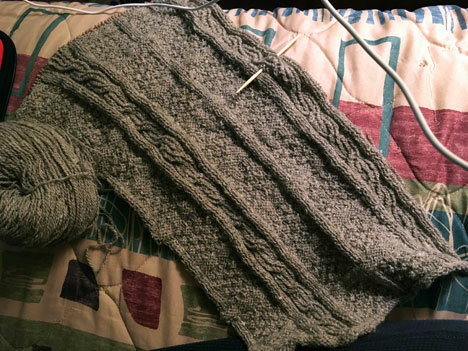 the sleeves are stockinette, so this can be my working swatch. of course i got here, finished the cuff, and realized i left the sleeve needle home (sleeves and body are knit on different needle sizes). DUH. 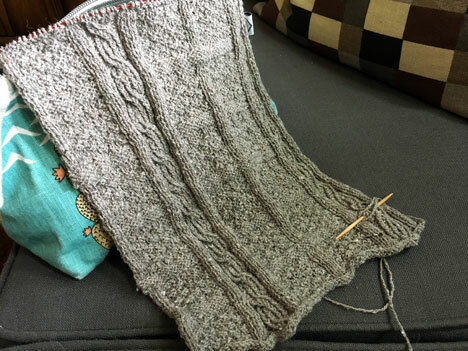 i’m in a situation where i could by another needle, but i may just hold off and work on the dock and cabin—after all, there is plenty of knitting left and i’m enjoying that equally well. we’ll see; i may yet decide to spring for the needle in favor of mindless knitting . . .
hopefully, we will be much too busy where we are to need that option! 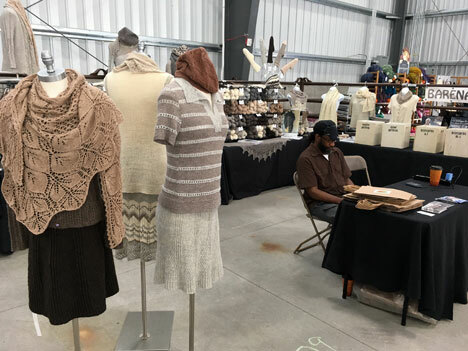 david and i are at the michigan fiber festival. i’m so excited to be working an out of town show with him! we will be here for two more days (sat and sun), so stop by and see us. 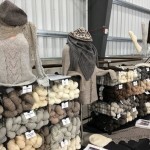 we are in the expo building, near the front on the right side—come and squeeze our skeins! yesterday we set out in the early morning and arrived at the show grounds mid-afternoon. 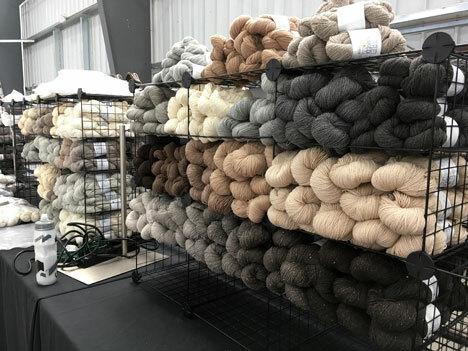 at this point, the booth is a cement floor and corral railing—time for us to transform it into a (hopefully) adorable wool shop. it takes a little while and some effort; first all the hardscape—tables, cubbies, and signage—needs to be loaded in. then we start filling in all that space with yarn, which is the most time-consuming part. it really helps move things along if your partner is the chatty type (erica and i have this down pat, haha), but david is not so much into that (mostly i chatter all by myself). 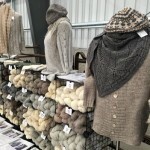 soon enough though, we had a lovely array of wools on display in all shades. once the yarn is in place we can add in all the mannequins and devise outfits from the samples we’ve packed. 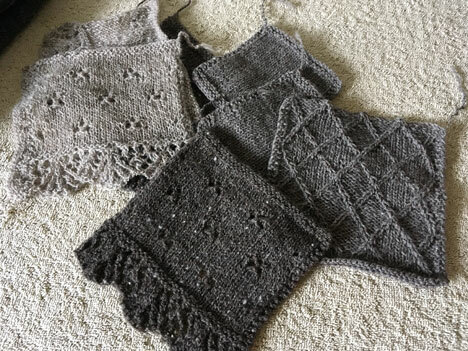 you’d be surprised at how long that takes; i tend to fuss over them a bit too much, but making them seductive to knitters is important to me (and really gratifying when customers exclaim over them). 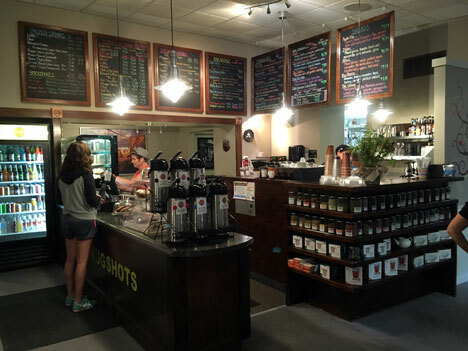 this morning we found a great coffee shop right around the corner—mug shots—and caffeinated ourselves well on the way to the fairgrounds. we didn’t realize it but we were actually a full hour early, but we put the time to good use, tagging yarns and making adjustments to the displays. finally it was all done and i was happy—we were open for business. we had a wonderful day today with a steady stream of visitors. i am really excited about tomorrow too—our friend cherie will be joining us with and extra set of hands and an extra lifetime of expertise; i can’t wait to see and work with her! come and visit us, even if it’s just to chat. we’d love to see you! 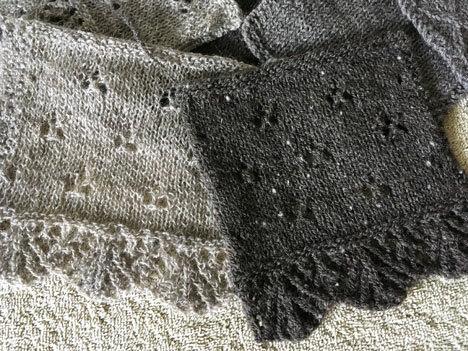 when i come back i think i’m going to do a post that is just about the lace scarf project—i’ve got pictures, swatches and progress to share; it’s getting very exciting. 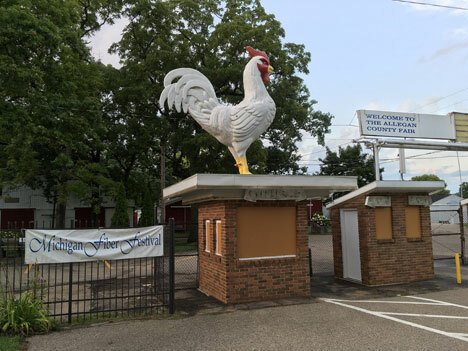 see you next time—or at the fair. i am a southerner and i know nothing beats stewed okra and tomatoes! 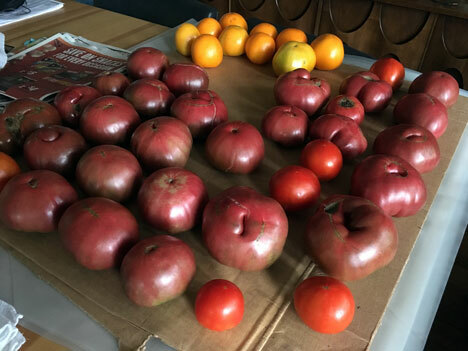 unbelievable garden bounty, anne. and i am already in love with the lace swatch. 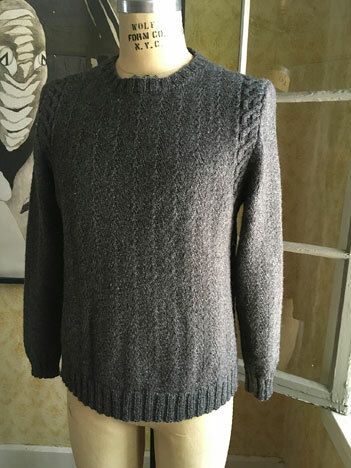 BTW the array of BNK yarns is spectacular! I really love your twill pullover. Those side cables are my favorites and they look fantastic at the seams. Love seeing all your swatches too. Thank you for the link to how to dry tomatoes! I have some extra and try that. You’re right about how tomato sauce always seems a little watery even though it cooks for a long long time. I’ll try drying…..
Have a great show! Everything looks fantastic and how fun that Cherie will be there to help! Hoping the show is a huge success! The booth looks wonderful! Your yarn and produce look equally scrumptious. 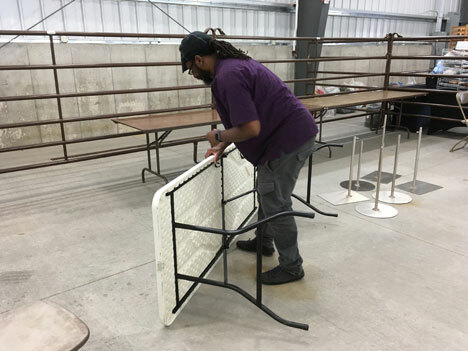 Fascinating description of setting up for a show–thank-you! And IMHO nothing beats roasted tomato sauce–yum! 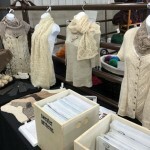 Pop up shop looks great – wish I could visit! I am in love with the twill pullover. have a wonderful show. Enjoy! I grew up in W. Michigan, went to undergrad in Kalamazoo, and my mother-in-law still lives near Allegan. 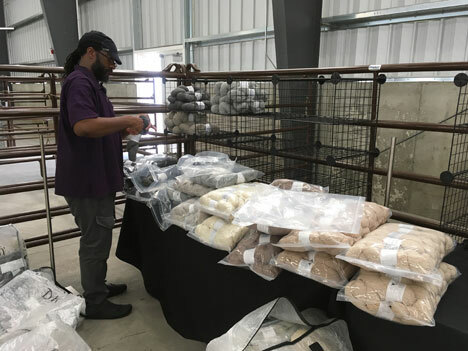 Must make it to the fiber fest one day! Adding to the love for the twill pullover. I know the labor of booth set up, but you all sure make it look easy! Beautiful display! So much beauty! The okra and tomato photos are stunning, and I love the sweaters. Envious of your garden produce. This years ours was a bust having got hit with hot weather when we could not water it for about four days. I have lawyas been intimated by okra. Want to share any recipes? It would be nice to attend that show except for the remortgaging part lol! Your comments about the mannequins brought back an incident from childhood. Playing make believe, I walked up to a beautiful mannequin and pretended it was my mother. An officious store clerk, walked up and said, “Little girl, your mother is over there.” Well, duh!